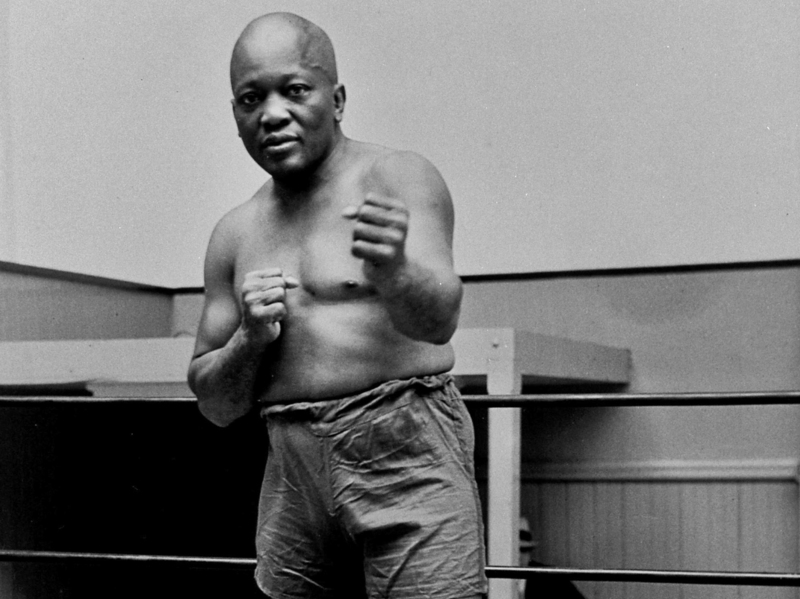 Legendary Boxer Jack Johnson Gets Pardon, 105 Years After Baseless Conviction : The Two-Way The black world heavyweight champion was convicted of a crime in 1913 for traveling with a white girlfriend. President Trump issued a rare posthumous pardon after an appeal from Sylvester Stallone. 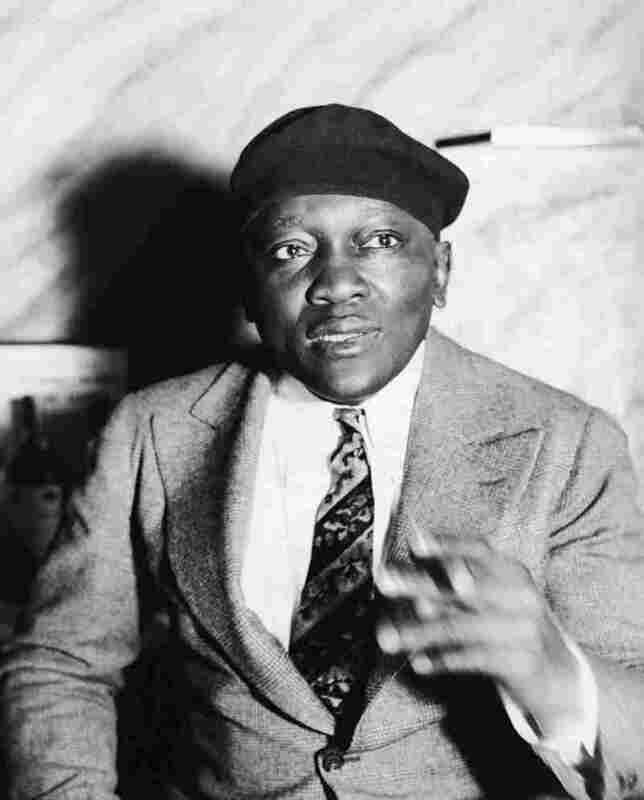 Jack Johnson, seen here in New York City in 1932, was the first black world heavyweight champion. On Thursday, President Trump granted him a rare posthumous pardon, clearing his name more than a century after a racially charged conviction. 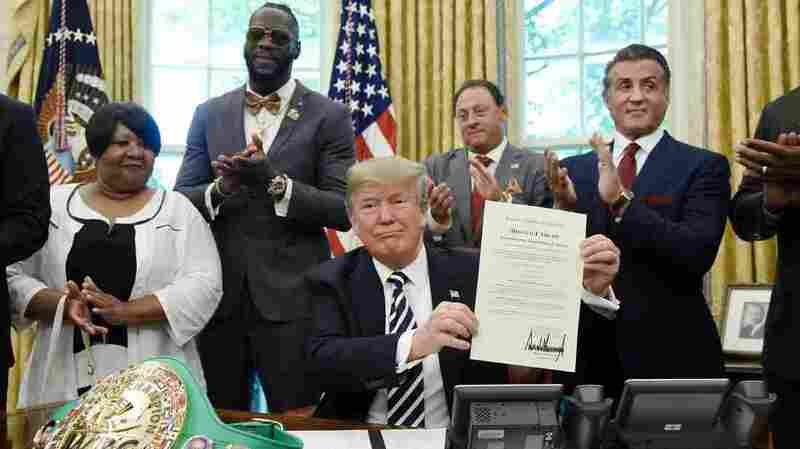 Boxer Jack Johnson, who was the first black world heavyweight champion, has received a posthumous presidential pardon after years of bipartisan efforts by lawmakers and family members to clear his name — and a personal appeal from Sylvester Stallone to President Trump. Speaking in the Oval Office on Thursday afternoon, Trump praised Johnson as "one of the greatest that ever lived. ... He was pretty much unbeatable." Trump noted that the fighter's 1913 conviction, which was tied to his relationships with white women, was one that "many view as a racially motivated injustice. He was treated very rough." Johnson fled to Europe after he was convicted but ultimately returned and served several months in prison. He died in 1946. Presidential pardons for people who are deceased are extremely rare. The Justice Department says the limited resources for processing such pardons are "best dedicated to applications submitted by living persons who can truly benefit from a grant of clemency." A bipartisan group of legislators had appealed to former President Obama to make an exception for Johnson, to no avail. "I am taking this very righteous step, I believe, to correct a wrong that occurred in our history and to honor a truly legendary boxing champion," Trump said. President Trump holds a signed Executive Grant of Clemency for boxer Jack Johnson in the Oval Office of the White House on Thursday, as (from left) Johnson's great-great niece Linda Haywood, boxer Deontay Wilder, Keith Frankel and actor Sylvester Stallone applaud. Linda Haywood, Johnson's great-great niece, said her family had been "deeply ashamed that my uncle went to prison" and thanked the president for "rewriting history." Stallone called the decision "incredible" and "a long time coming." Johnson, the son of former slaves, was spectacularly successful in the ring, winning the world heavyweight title in 1908 and holding on to it for years — even as white Americans openly called for a "great white hope" to defeat him and regain the championship for the white race. He celebrated his wins, and his money, with panache and without apology. The white rage and resentment against Johnson fueled violence: After Johnson defeated white boxer James Jeffries in 1910, white men in New York set fire to a black tenement building, white mobs in Atlanta chased after black people, and a black man in Houston who announced the result of the fight on a street car had his throat slashed by a white man. In 1912, Johnson was arrested for violating the Mann Act, an anti-prostitution law. An all-white jury found that when Johnson traveled with his 19-year-old white girlfriend, he was transporting a woman across state lines for an "immoral purpose." Johnson smokes a cigar in the 1930s. The boxing champion was an avid reader who loved opera, and flaunted his wealth with his sports cars and furs. The conviction was transparently a punishment for Johnson's relationships with white women; he repeatedly married white women, in addition to his white girlfriends. After he fled the U.S., Johnson lived in Europe for several years evading his Mann Act conviction. He lost his title to boxer Jess Willard in 1915, and in 1920, he returned to the U.S. and served less than a year in prison. Johnson died in 1946, after angrily speeding away from a diner in North Carolina that either refused to serve black people or tried to force him to sit outside. His car struck a light pole, and he was sent to the nearest hospital that would treat black patients, more than 25 miles away from the site of his accident. Haywood told the Los Angeles Times that some of her family members have been ashamed of Johnson because of his prison sentence. "They were led to believe that he did something wrong. They were so ashamed after being so proud of him," she said. "The white man came and told them that he did something wrong, he did something dirty, and they painted him out to be something that he wasn't." "The last thing you want to do is die and have your name tarnished," Haywood told the LA Times. "That's wrong."